China is rebalancing its economy away from exports and investments towards consumption. The slowdown of Chinese export and investment growth - which was felt clearly in 2014 and 2015 – is weighing on the country’s trading partners. To measure the impact of rebalancing on China’s trading partners, we contrast two short-term scenarios: one in which the Chinese economy continues to rebalance in 2017-2018 and the other, in which growth rates of investments and exports bounce back to rates that were common before the slowdown. In the rebalancing scenario, China’s four closest trading partners are expected to see a GDP slowdown of 1%-1.5% in the period 2017-2018. The cumulative negative impact on global growth is estimated at 0.8%. China’s growth model has traditionally been strongly reliant on investments and exports. The Chinese leadership is becoming increasingly aware that this growth model is not sustainable. High investment growth, often credit-financed, has created overcapacity in heavy industries such as mining and steel. At the same time, the share of consumption in GDP remained comparatively low. In 2013 the Central Committee of the Communist Party put forward a series of major reforms to ensure a sustainable growth path, with consumption becoming the main growth-driver instead of investments and exports. In this research note, we look at the impact of this process on China and its trading partners. China’s progress on rebalancing is still limited. The share of consumption in GDP has increased only slightly, from 35.4% in 2010 to 38.9% in 2016, and remains lower than for some of its poorer neighbouring countries. While growth has become less investment-driven in recent years, the share of total investments in GDP remains high at 45.0%. 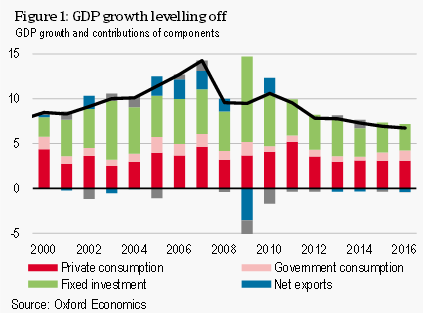 Growth of private consumption was insufficient to compensate for lower investments. Over the past years, this has resulted in a decline in GDP growth, from 10.6% in 2010 to 6.7% in 2016 (Figure 1). The trade implications of China’s slow, gradual rebalancing are still significant. The country has grown to be a major assembling hub, especially since its accession to the World Trade Organization (WTO) in 2001. In 2016, China had a global import and export market share of around 10%. The transition from exports and investments to consumption has a negative impact on import growth. This is because the import intensity (the share of spending falling on imported goods) of investments is around 50% higher than that of consumption and that of exports is around 40% higher. Additionally, the global commodity price decline has also been weighing on import growth in recent years. In volume terms, Chinese import growth slowed from an annual 22% in 2010 to 0.7% in 2015, and reached 3.8% in 2016. Research by the International Monetary Fund (IMF) confirms that much of the import slowdown that occurred in 2014 and 2015 can be attributed to China’s rebalancing economy, particularly to lower investment and export growth. The rebalancing of China’s economy has been felt by its trading partners, especially the countries for which China is an important export destination. The Chinese government has retained its somewhat ambitious growth target of “around 6.5%” for 2017 to strengthen social stability ahead of the 19th National Congress of the Communist Party in the fall of this year. The Communist Party is expected to conduct a reshuffle of its top decision-making body, allowing Xi Jinping to consolidate his leadership position. Despite efforts to make growth more sustainable, imbalances in the economy created by high credit growth - especially in relation to state-owned enterprises (SOEs) – remain substantial. Corporate liabilities have reached 166% of GDP in Q4 of 2016, according to the Bank for International Settlements (BIS). Increased borrowing by SOEs has contributed significantly to this rise, and SOEs account for almost half of corporate debt. Many SOEs work inefficiently, have weak management and depend on state aid. They offer as low as one-third of the return on assets that private firms offer. Large-scale restructuring is necessary, even though it will cost millions of jobs. The overcapacity problem is worst in mining, steel and other heavy industries. The Chinese authorities have started to tackle the issue by imposing budget constraints and starting to restructure SOE debt, but progress is currently slow. After the National Congress in the fall of this year, bolder steps are expected, which is likely to depress growth in the period ahead. Lower governments play an important role in financing SOEs, working with them in setting up infrastructure projects. This interdependence implies that also local governments will invariably feel the impact of SOE restructuring. The Chinese government is aiming for a slow, gradual adjustment of its economy, but it remains a balancing act. If credit growth slows too abruptly, it could crush investment and import growth. Thus far, authorities have succeeded in preventing a hard landing. Import growth has slowed considerably in recent years, but has remained in positive territory. To assess the implications of a period of on-going rebalancing on trading partners and the world economy we contrast two scenarios: a baseline scenario in which authorities push forward with their rebalancing plan, keeping growth in 2017 and 2018 subdued around 6%, and an alternative ‘high growth’-scenario in which the government deserts its efforts to transition to domestically-driven growth, bringing investment, export, and import growth rates back to pre-2014 levels, and pushing GDP growth up to 7.2% and 7.6% this year and next. We implement these scenarios using the Oxford Economics Global Economic Model. Figure 2 contrasts Chinese GDP growth and spending components under both scenarios. In the high growth-scenario, we have adjusted upwards the growth rate of investments and exports, which then feed into the other spending components and GDP itself. 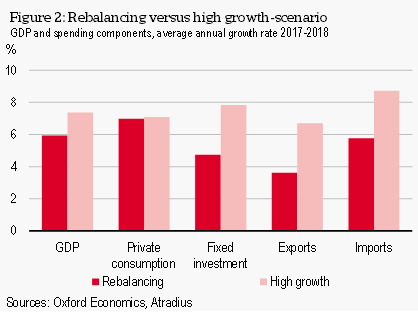 Import growth is remarkably lower in the baseline scenario of on-going rebalancing and would average 5.8% per annum in 2017 and 2018. This is 3 percentage-points lower compared to the high growth-scenario. GDP growth would average 5.9% per annum in the rebalancing scenario. While this growth rate is considerably lower than in the high growth-scenario, this still does not reflect what is commonly understood as a hard landing – for this GDP growth would have to slow down to around 4%. China’s economy accounts for 10% of global trade and 18% of global GDP, so this turn inward would certainly have global spill-overs. The rebalancing of China’s economy negatively affects its trading partners due to the dramatic effects to its import growth. The magnitude of the negative impact increases with the intensity of trade linkages, which depend on geographical proximity and whether a country is a large commodity exporter, since raw materials represent such a large input in China's investment projects. Comparing both scenarios, it becomes clear that the impact of on-going rebalancing is felt the strongest in Singapore (-1.4%), Taiwan (-1.1%), South Korea (-1.1%), Chile (-1.0%) and Qatar (-0.8%) (Figure 3). Singapore, Taiwan and South Korea owe their close trade linkages to their geographical proximity to China. Chile and Qatar, on the other hand, export large quantities of commodities to China. The negative impact of China’s rebalancing will be particularly felt by its closest trading partners, but also by the world economy. Should the Communist Party maintain its rebalancing agenda as opposed to allowing higher, unsustainable, export-oriented growth, we conclude that the negative impact on global GDP growth would be 0.8% over the period 2017-2018. China is rebalancing its economy away from investments and exports towards consumption. This has caused import growth to slow down, particularly in recent years. 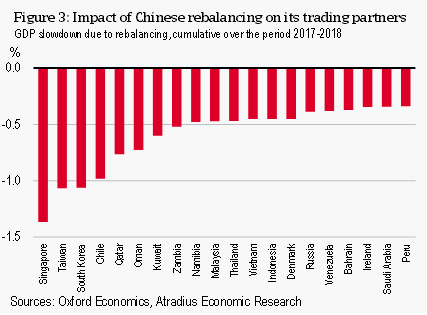 As China’s rebalancing is likely to continue over the next two years, its trading partners will most likely feel the impact. Its four closest trading partners are expected to see a GDP slowdown of 1%–1.5% through 2018 compared to a scenario in which China’s economy quickly rebounds. The impact on global GDP growth is estimated to be a negative 0.8%.